In my last post, I talked about the extreme highs and lows of my first 30 days in business, even threating to jump on a plane and run away from it all. Well, 90 days later I’m still at it, with no plans of catching a plane anytime soon. We now have financing, clients, and a corporate identity. Still plenty of work to do but the focus is now on building the pipeline and less on losing my house, our retirement, and so many other things that will go through your head late at night while second-guessing yourself. Everything (and I mean everything) will take 30 to 60 days longer than expected – be it a loan, new project or client, even a business card order will take longer than anticipated (if you’re a novice). Add days to your expectations, push timelines out and start earlier than you planned. There are certain things out of your control and you may be less frustrated you if you keep this in mind…or maybe not. Get half decent at everything – if you’re starting a business you are obviously knowledgeable, passionate and perhaps even an expert at something. Similarly, you’ll lack knowledge or depth in other areas. What I’ve learned is it is crucial to get a working level of knowledge on just about everything. You don’t have to be the “expert” but you have to have a base of knowledge to give direction to your advisors/experts (like attorneys, accounts, designers). Fortunately, there are plenty of good resource sites available (for example, com). Trust your network – the “net” that will appear once you leapt will come from your network. You likely have more people in your circle that can, or will help you along your journey than you realize. One of my most trusted advisors turned out to be someone I’ve known socially for close to twenty years. It wasn’t until 60 days into this journey that I thought of him. You will be surprised by the support of friends, family and even acquaintances. If they can’t help you directly, there is a good chance they’ll know someone that can. Your network will be one of your most valuable assets, mine it. Surprising financing options – depending on how your business is organized you may be able to take advantage of your 401K to fund the business or give yourself a line of credit. If you establish the business as a “C” corporation you can use your 401K as capital to buy a franchise or business or to fund it. There are some potential downsides to consider, so please consult a tax attorney or accountant before moving forward. SEP IRA – speaking of 401K’s you may be deferring your 401K contributions like I am until the business is profitable. The Simplified Employee Pension (SEP) allows for a contribution of up to 25% of an employee’s pay up to $55,000 in 2018. As your business takes off your SEP gives you an opportunity to catch up on your retirement savings. Payment terms of 60 days or longer – are pure evil for a startup. It’s absolutely ridiculous for a large corporation to expect a small business to float them for any period of time after a project has been completed. Cash flow is king and it’s also a killer for small businesses. As soon as we reach a certain level of success, we will actively avoid contracts with payment terms of that length. The learning, make sure you invoice your client as soon as the contract is signed! Billion dollar corporation, encourage procurement to develop new payment terms for small businesses. You can, and should, support the growth of new businesses. We may end up being your innovation incubator. I hadn’t had that type of feeling in 20 years until today. It was back in grad school. I had a professor who taught a class on entrepreneurship. He was a highly decorated Green Beret who had founded a major manufacturing company after he left the army. As he regaled us with the story of building his company he mentioned missing the births of his children and much of their early lives. He wore it like a badge of honor, not a lick of remorse or regrets, despite having many years to reflect back. It was awkward. I’d never seen a presenter so misaligned with an audience, until today. I just returned from a conference about the future of technology and its impact our lives. Founded by a parent of an autistic child who had gone on an exhausting journey hoping to learn how new technology may be able to improve the child’s life. A VR company gave a 3D game demo on how they were using virtual reality to help improve the therapeutic outcomes for autistic children. And then came the presentation from a global communication behemoth. Except the presentation wasn’t a presentation. It was a self-center, chest pounding, aren’t we “great” type of speech, which would have been perfectly at home at a technology conference five years ago, but felt totally out of sync today. We heard about their history of innovation, recent acquisitions, and the billions they were investing in the US. What we didn’t hear was how their incredible technology was going to make our lives, our children’s lives, or our communities better. They lacked purpose. You could sense the disconnect with the audience, the awkwardness was palatable. It was an uncomfortable feeling, I hadn’t had in a very long time. Leaving the event, I was thinking maybe it’s just me and the people I associate with who are looking for something more from organizations or…maybe this company, like my professor, really doesn’t get it. In the 90’s casual Fridays brought about the slow death of formal business attire in the office place. In the new millennium, mobile devices effectively eliminated the “9 to 5” workday and erased the line between personal and professional. Now, the “Gig Economy” is about to kill the concept of a company employee. The freelance workforce is growing three times faster than the U.S workforce. At this rate, according to a recent survey by Upwork and the Freelancers Union, independent workers will be the majority by 2027. Yes, more people will work for themselves than for corporations, and they will be doing it because the want to…not because they have to. The work is not what you would think of as typical “gig economy” jobs, e.g. an Uber driver. According to the FIA survey of close to 6,000 adults, this group is preparing for the future more swiftly than traditional employees. Nearly half of the freelancers surveyed told researchers that their work is being impacted by AI and robotics (only 18% of the traditional workforce). As a result, 65% are staying on top of the latest trends and are putting time aside to learn new skills, compared to 45% of traditional corporate employees. As a result, this specialized workforce is finding independence because it is developing high demand, hard to find skill sets, creating an opportunity for them to offer their time to the highest bidder. Rather than work on projects dictated by an organization for a set salary, they can choose to work on various projects based on their interest for multiple companies. Selecting projects that advance or refine their skill sets. Deepening their experience that increases market value. This practice, commonly seen among IT workers, is now making its way into other areas like marketing and HR because of the increased use of digital tools and platforms. It’s not only employees who are driving this trend. Employers see this as an opportunity to optimize their staff cost. The “Open Talent Economy” described by Deloitte is expected to grow significantly in the next 3-5 years. According to their research “off-balance” sheet employees will grow 66 percent over that time period. While only 6% of the C-Suite rated this trend a priority in 2017, 26% believe it will be important in the next 3-5 year, an increase of 400 percent, one of the largest increases seen in their annual Global Human Capital Trends report. Sitting between, and enabling these trends are digital platforms like Upwork, BTG and Carbon Design which are enabling this transition. 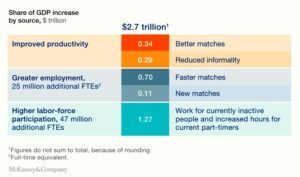 McKinsey Global Institute report, A labor market that works: Connecting talent with opportunity in the digital age, states that these platforms could boost global GDP by $2.7 trillion by optimizing the match between work and employees, and by pulling 47 million inactive people (globally) into the workforce. As the US reaches full employment these “inactive workers” will be a critical source of labor capacity. Unemployment fell to a 20 year low in Q4 of 2017, now standing at 4.1. A tight labor market will increase competition and opportunity for employees with specialized “in demand” skill sets. Talent now has leverage; however certain items may slow this revolution in the workplace. Healthcare is the primary one, retooling and training of inactive workers being the other. Look for these talent platforms and AI to play a role in resolving those challenges in the future. Additionally, changes to regulatory frameworks, corporate practices and individual mindsets, may be required according to McKinsey’s research. One thing is certain, the forces behind this transformation are accelerating driven by the recent tax changes. Apple and Amazon have announced they will be creating tens of thousands of jobs in the US. Added that amount of new positions to an already tight labor will force us to think about how work is done, and who does it. The jobs may be here but where the “work” gets done may not. We may not only see the “death” of the company “employee” but also the concept of a “domestic” workforce.